The Overhead Wire: Could BRT Carry 7 Million New Yorkers? Could BRT Carry 7 Million New Yorkers? On the east side of Manhattan, the right BRT configuration would carry almost as many commuters as the Second Avenue Subway, for a fraction of the cost. For a fraction of the cost you get a fraction of the ridership and a fraction of the service. How many buses and how many Union wages would it take to get that level of service? Let's all imagine how much it would cost operationally to carry ~7 million daily subway riders on buses every day in addition to the 2.3 million people that already ride buses in New York. Let's see what kind of a city New York would be without the Subway. There is a specific crowding issue that needs to be addressed on the east side and if you amortize that $5 billion over the lifetime of the tunnels it is well worth the investment over centuries of use. Instead of taking everything Walter Hook and the BRT/rubber tire/World Bank lobby say as gospel, how about talking to other people who have written a few books on the subject. Say a certain professor at UPenn who has written three tomes on transportation operations and planning. You want less people to ride transit? Then build inferior transit. In all actuality though, this country needs more Metro Subways. You know, the kinds of things they have in first world countries on the European continent. Washington DC is an example of a place that has developed more recently around the subway. Regions that build BRT will always be car cities. If you want to truely transform regions, we're going to have to think bigger. I think a lot of people talk about Arlington County because of the great success it has had in development. Yet no one talks about what Atlanta was like on Peachtree just north of downtown or in the Buckhead area just north of there before MARTA. Not a lot of people seem to realize that San Francisco is much more dense now because of BART and Caltrain connections as well as the Muni Metro than it ever would have been without. In fact, certain companies have pushed the MTA in San Francisco to make Muni better or they will leave. They wouldn't be saying that if we had a system that actually worked. The problem with places like San Francisco and Atlanta is that they didn't go far enough. They built a couple of lines and then stopped. If we truely want to see our cities transform, we need to go further and without BRT as THE substitute idea for Heavy Rail or Semi Metro Light Rail. It's an outrage to think that people actually think this is a real alternative to transform our cities and turn the population to transit. It's just us being cheap. We're already cheap with transit, and look where that gets us. To more people riding cars and more sprawl. In the city's plaNYC 2030 sustainability plan, they praise BRT unconditionally and, on a page, give a blurb to mentioning Ottawa and the Transitway as a model. I'm not so sure. Do the guys at Streetsblog claim that "the public has no preference for trains or buses", all things being equal? Do they claim BRT is "greener" than rail? Walter Hook is, I found, a member of one of the major BRT proponents, Institute for Transportation and Development Policy (ITDP). And it's based in New York. And who could forget this one, Bill Vincent and the so-called "Breakthrough Technologies Institute", which claims BRT is "Better Rapid Transit"? Is there some hidden agenda for BRT? Do the people proposing it actually use some form of transit? Or are they car centric, and figure this makes them look like they favor transit, and then set it up to fail? I've taken both Streetsblog and the Tri-State Transportation Campaign to task for their uncritical promotion of "BRT," but I don't think they have some sinister agenda. I know several of the Streetsblog and TSTC folks, and it's pretty clear that they like and support all forms of rail. They're heavy bicycle users, but I've seen plenty of them on the subway. I wouldn't call them car-centric at all. Maybe I'm being played for a complete chump, but my sense is that they support "BRT" because they think it's cool. BRT is seen as cutting-edge in some circles, so they want to be on top of it. They also seem to be convinced that light rail and more subways are a long shot in NY, so they want to promote alternatives. I don't have a problem with that in theory, but I hate the dishonesty involved in phrases like "surface subway" and the way that TSTC seems to be turning a blind eye to the Thruway expansion plans because the bureaucrats put "BRT" in their plans. I don't know this Walter Hook guy, but he seems to be the most dishonest of the bunch here in NYC. Whether he's intentionally dishonest I'm not sure. Having really just scanned that SB post yesterday, I got the impression that they were promoting that not as something in the stead of the 2nd avenue line, but rather something they could put in place now on the corridor to relieve the Lex congestion until the line opens, which is no closer than at least 7-8 years, right? That said, they certainly are BRT boosters, but I don't think there is a sinister agenda in play at all. And like Cap'n, I too am dismayed when it's brought up in intellectually dishonest ways, like "surface subway" and portrayed as equivalent service to heavy or light rail. I think they mentioned that Hook was from ITDP in the very article. No secret there. Wouldn't running 2 buses at the same time just to provide the desired level of service seem to suggest that the mode is not appropriate? I have to admit, I'm getting a little tired of the frequency with which this blog breaks from supporting transit to oppose transit, but only if it has rubber tires. It's like reading monorail advocates endlessly bash LRT because it isn't monorail and they'd rather have nothing at all than a technology they happen not to like. Why is this? Rapid busing is something. In most cases, the only viable alternative provided has been nothing substantive at all. Why is the notion of rapid busing more problematic to you than the notion of no transit? In fact, certain companies have pushed the MTA in San Francisco to make Muni better or they will leave. They wouldn't be saying that if we had a system that actually worked. Okay, this is just a pet peeve of mine. Quit complaining. Muni works. It gets you where you're going, and lots of people take it. If it didn't, and they didn't, nobody would care about Muni. It may not work as well as it could, but but that's a different matter, and you shouldn't confuse the two. The Streetsblog people love LRT and rail. They support BRT in cases like this because, unlike you, they are operating from a place of pragmatism and realism rather than a place of theory and ideology. There is no nefarious agenda here -- simply people trying to get changes made. A lot of good people have concluded that BRT is the fastest, cheapest most high-impact way to re-program NYC streets from automobile use to transit. Streetsblog, T.A., TSTC, NYC DOT, NYC Transit don't have the luxury of operating in a place of theory. They are operating in the on-the-ground reality of New York City politics and transportation infrastructure. BRT is the best solution in that reality. They are working with the city that we've got, not the city that we all wish we had. Union wages would also need to be paid to light rail operators and mechanics. NYC's CNG buses are pretty nice when it comes to fumes. LRT simply moves the fumes to the powerplant in Queens. On a per traveler basis, streets configured for BRT are far more efficient oil burners than streets configured for automobiles, which is the REALITY that we are currently dealing with. Energy-wise, the big problem in NYC right now is electricity generation. In summer we don't have the capacity we need and NYC is legally mandated to produce much of its own electricity. Also note: Buses in Hamburg, Germany are being run on wind-generated hydrogen fuel cells. The lanes taken out for BRT will be less damaged than they would be if they continued to be used by commercial trucks and private autos. And you know what's going to be a lot of up-front, costly damage? Tearing up streets filled with underground infrastructure to install LRT rails. See Vision42.org. The cost of doing that in NYC are staggering. Again: That's our REALITY. That cost is nothing compared to the cost of installing an entirely new LRT infrastructure. We have lots of buses and contracts w BRT suppliers already. LRT means we need huge capital start-up costs to buy new LRT vehicles, rails, stations, depots -- everything. Cost-wise, BRT is the far better deal for a city that's already running the biggest bus system in the US. Dude: Have you ever even been to NYC? Have you ever taken a ride on the 4 train during rush hour? Have you ever taken a ride on the 2nd Avenue bus during rush hour? I think this shows real ignorance of the REALITY we're dealing with in NYC. We called ourselves Trolley Dodgers in the beginning of the 20th century b/c so many Brooklynites were getting killed by LRT vehicles. How is LRT vs peds any different? Versus our existing car traffic sewers? NYC DOT and the Mayor do not need Albany approval to reconfigure its own streets. They don't even need City Council approval, really. Fundamentally, in your thinking on this issue, it seems that you are just coming from a place that is not New York City. I think a lot of local LRT advocates recognize that the best way to get LRT done is to start with BRT. i'm all in favor of brt as an upgrade to local bus service, i have a problem with it when it promises to be a cheap alternative to subway, especially in a city like nyc that needs to expand its existing ultra-high capacity subway and rail network. by all means have dedicated bus lanes and shelters and real time readers on 5th ave, 42nd, 34th, 125th, 14th, etc. The point is, though, that where we have had BRT, in many cases, rail has come eventually. At the risk of saying "it's not a bug, it's a feature"... isn't that kind of the point? Rapid busing is a stopgap that provides, at least to some extent, improved transit service to the neediest areas cheaply and very quickly. Rail, while certainly improved over BRT in many ways, usually takes much longer to implement. BRT will put something on the ground now that serves as a foretaste to rail. Are you seriously suggesting that if there are proposed long-term solutions in a transit corridor, there should be no immediate improvements to that corridor if it can be served by buses in the near term? Looks like there are a lot of comments on this one. Guess we have to be controversial to get a discussion going. I agree with Cap'n. I don't think the SB folks are in on some sinister plot and like many of you have said they are dealing with the reality of the political situation up there. What makes me sick to my stomach though is when claims like the quote I posted go completely unchallenged on their front pages. Again, I think BRT should be standard for buses in dense areas but not a replacement on corridors that should be rail. Those of you who follow the blog closely know that I've said that before and I'll continue to say that. I also ride buses all the time in Oakland and SF. 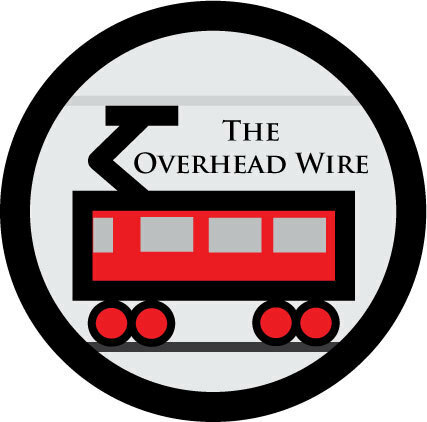 But in case people didn't notice, this is a blog called the Overhead Wire, not the Rolling Bus Tire. Arcady: If Muni worked the way it should, then I'd be able to get places in the city I want to go,like the Outer Richmond, without having to take an hour and a half. Don't get me wrong, it works when I want to go downtown or a little bit crosstown. But I don't have the mobility I should in a city like San Francisco. Maybe I should just stop complaining and leave SF to its devices. Anyways, I appreciate the comments, even the ones about me being in some ivory tower. We don't have to agree all the time, but I will blog about what I enjoy blogging about, and that is electric transit. Daniel, thanks for your comments and tweets. I'm not a huge fan of people movers. Especially since the cost of this one is specifically insane for what it's going to do. For more background checkout Transbay Blog this morning. There is a good writeup there. With all due respect, it's sounded for a while like you've been more concerned with someone thinking that rapid busing is a replacement for rail than whether it should be implemented. In fact, I can't remember any support here for its implementation that hasn't come part and parcel with a nascent fear that it will replace rail (except, of course, when it comes to airport commuters already pressed for time, but apparently they are in such a vastly different category from other transit users that it defies comment). This overarching fear seems to suggest that buses are so much worse than rail that they aren't even worth considering in the short term, outside of the occasional "buses are nice, but..." comment. Again, you don't appear to be refuting the notion that there should be some kind of bus-related transit improvements while the Upper East Side waits a decade or more for the Second Avenue Subway to be completed. Should the San Fernando Valley have accepted no transit at all rather than the apparently horrifying embarrassment of the Orange Line and its enormous ridership? Even when explicit promises have been made to further improve the corridor and implement rail as soon as possible? Word! It's socially popular to bash Muni, but show me another city in America with almost as many daily trips as citizens. Could it be better? Of course! And we ought to be working to make it better (something this blog does well, IMHO). But I always try to be careful about Muni bashing, because plenty of people with little experience hear our bashing and get the completely wrong impression. And others hear our kvetching and concoct hairbrained plans to turn our 700,000 daily trip system into the VTA or Samtrans. I found an excellent PDF for a thesis statement about converting my city of Ottawa's Transitway to light rail. The thesis was written by David P. James, a student studying for a Master's Degree in the Faculty of Environmental Design at the University of Calgary. It can be found at the link of http://homepages.ucalgary.ca/~dpjames/mdp/david_james-mdp-final.pdf. This is a peer reviewed paper. In Chapters 4-6, some very effective points about issues revolving around convertability of busways to light rail are made, and I would suggest this be read by anyone currently planning busways. I agree with the point that any busways that are going to be built in the future should be done in a manner so as to facilitate a conversion to light rail, rather than simply allowing it. Needless to say, however, I am still not a fan of BRT and am a skeptic. Like the author of this blog, I am more into rail, and would never support paving over rail lines into busways. Cap'n: I read your post at http://capntransit.blogspot.com/2009/01/dont-give-rail-infrastructure-to-buses.html and liked it. Besides, for all this talk about hydrogen and fuel cells coming to "rescue" us, Hamburg is already gonna get LRT, and so is Copenhagen. Yes, rail costs more "upfront" to build, and we need to find a way to pay for it, and BRT can appear to be quicker in terms of implementation, and some things sometimes have to be sacrificed, but I would never advocate BRT as a substitute for rail of any kind. There just seems to be too much emphasis on the short term. And I thought "Trolley Dodgers" were called as such not for being injured by the trolleys, but rather for fare evasion. Rail is not a "luxury we can't afford", in spite of the "realities" as noted. BRT looks nice, but rail is better, in spite of all its serious flaws. Finally, the comparison of emissions from a coal burning power plant supplying electricity to electrified transit to those from diesel buses, even if it is a "hybrid electric vehicle" or running on hydrogen or fuel cells, appears to be an invalid comparison to make BRT look better. One more thing. I know you linked this post in an anti-BRT series last year on one of my favourite posts on your blog, but I have the link to Streetfilms from Melbourne. This is all well and impressive that Melbourne kept its trams, but it shocks me that the largest surviving streetcar (tram) system is not in an American city or a European city, but in an Australian city! Dude, Australia is so far ahead of the US in so many ways your surprise is very amusing. I have a full list, but it's a little off topic. Not north of Geary. I think that's the author's point: we need more lines. i think besides the question of whether or not a system works, is a question of whether or not a system works as well as it can, and if the people who use that system deserve better. SF deserves better and I think it's important to identify funding sources and changes that can make that a reality. first of all, brt isn't always that slow or low capacity and light rail isn't always that fast or high capacity. The green line in boston is pretty slow, as is Muni LRT, and even parts of the NYC subway system b/c they were built so long ago and their infrastructure hasn't really changed that much. In fact, a well constructed brt line built today might even be faster and have higher capacity than some of those systems. However, the real important note is that nyc cannot just up and build a subway system overnight, and whatever they build won't be enough. in nyc you have a rare breed of americans who are often willing to go to great lengths to take public transit. in fact, many of them are HUNGRY from more transit. the problem with buses in NYC is that they are SLOW. However, i guarantee that if you build a real brt line in nyc, even in a borough other than manhattan, and you place that brt line on the subway/metro map (like boston or la do with their brt lines) then that line will carry more passengers than nearly any light rail line in the country. A high capacity subway line would be ideal sure, but in a place where that will take 30 years to build and cost a lot, why not build a BRT now and spend 30 years turning the other 4 boroughs into another "Skyscraper National Park." of course, this entire conversation is mostly moot since nyc will be mostly underwater by the time even the 2nd ave line is finished thanks to the carbon emissions of other cities in america where everyone drives suv's and noone takes public transit...right? This post leaves a sour taste in my mouth. The framing is unabashedly elitist and xenophobic. What's all this third world/first world talk? Frankly, many of our systems are fledgling and cash-strapped, much like the first world country, and thumbing our nose at their solutions out of a snobby notion that we're better than them is unhelpful. I thank anonymous for his/her thoughtful responses to some of the points made in this article. When you get beyond the surface dislike for bus service, the other arguments don't have much to stand on. I agree that BRT cannot handle the same passenger loads as subway or light rail, but it can still be a valuable option for vastly improved bus service at low additional operating cost above traditional bus service, especially in places that don't quite have the same street crowding problem as Manhattan. Frankly, many of our systems are fledgling and cash-strapped, much like those of the third world, and thumbing our nose at their solutions out of a snobby notion that we're better than them is unhelpful. The first world/third world distinction is actually very directly relevant to the BRT/LRT comparison. In the Third World, capital is expensive and labor is comparatively cheap. In the First World, capital costs about the same or slightly less, but labor is much, much more expensive. Another factor is that in the Third World, cars were relatively less affordable (this is starting to change), which means that people have no choice but to pack into BRT buses at crush capacity. And it's not just transit enthusiasts that look down on buses, it's everyone else too. And you really shouldn't be blaming your customers for being "wrong". As for Muni, I certainly agree that it could be better in thousands of little ways (and a few big ones too). But overall, the system mostly runs frequently enough that you don't have to plan your day around the timetable, and it does a reasonable job of getting you where you're going by the time you need to be there. And that's even without comparing it to, say, the VTA, where you'd get a single bus that runs every half hour (60 minutes on Saturdays and not at all on Sundays). Comparing to that, which seems to be a common standard of service in this country, Muni is just absolutely wonderful. Yeah, well, I like the train better. I do have some skepticism about BRT. If they show the BRT bus route(s) on rail maps, people may misintentionally think that this is a rail line! And maybe that has something to do with the fact that people who are rich enough to afford a car are willing to get on light rail but not a bus. The Onion had a great article about a buscrash a while ago.